As part of being a good neighbour to Torontonians, the Billy Bishop Toronto City Airport built a Ground Run-up Enclosure (GRE) where maintenance crews can perform aircraft engine checks. It went into service after seven months of construction. 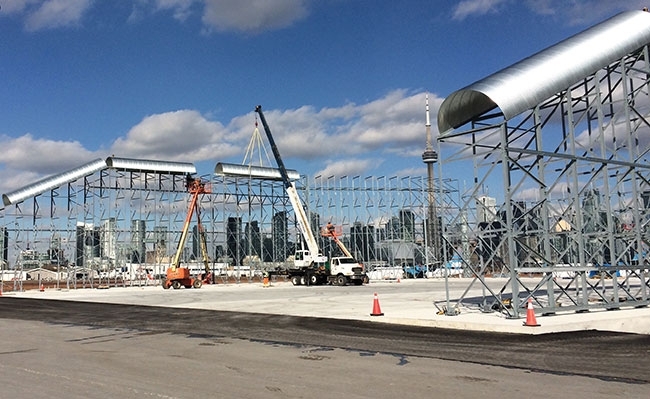 The Toronto skyline is visible through the partially erected Ground Run-up Enclosure. “From the creation of new infrastructure, to working together with the community and our airport partners on the implementation of policies, the noise mitigation program at Billy Bishop Airport is an essential component of airport operations,” said Geoffrey Wilson, CEO, PortsToronto, which owns and operates the airport, in an April 19 statement on the day the GRE officially opened. Located adjacent to Taxiway Echo, it is situated roughly 6,200 feet (1,900 metres) – pretty much as far away as practical – from the city. The 210-acre (85-hectare) airport occupies Toronto Island, the nearest shore of which is around 500 feet (150 metres) off the downtown’s shoreline. Although Billy Bishop has several main users of the GRE, its height, blast deflector and the pavement markings are all designed to serve the Bombardier regional turboprop Q400, which is the only aircraft operated by the airport’s largest user, Porter Airlines. “The facility is designed specifically for a Q400 aircraft to be safely powered into the facility, turned around and positioned for an engine run-up without the use of an aircraft tug. To date, the facility has been successfully used by operators of most of the aircraft that operate regularly out of the airport such as the Q400 and Dash-7,” says Don Bergin, president of Reno, Nevada-based Blast Deflectors Inc. (BDI). Larger-sized propeller aircraft have not been evaluated for the GRE, and jet aircraft are not allowed to use the airport. Mississauga, Ontario-based Pave-Al Limited did the civil work, including the concrete foundations and paving, while Toronto-based WSP Canada Inc. was the project consultant. As the design-build subcontractor to Pave-Al, BDI designed and installed the GRE. The $9 million project is part of the PortsToronto Airfield Rehabilitation Program. Worldwide, BDI has supplied 30 GREs similar to the three-sided design chosen for the Billy Bishop GRE, including a 251.3 ft (76.1 m) long by 2.8.3 ft (63.5 m) wide by 49.9 ft (15.2 m) high GRE at the Vancouver International Airport, completed in 2012. The Billy Bishop GRE is 207.7 ft (63.3 m) wide and 216.5 ft (66 m) long, again sized for powered in/out operations by the Q400. The wall heights are designed specifically to meet the acoustic objectives dictated by PortsToronto: The north wall, which faces downtown Toronto, is 45.9 ft (14 m) high. The south wall, which faces Lake Ontario, is 36.1 ft (11 m) high, as is the rear wall. The strip foundations required 23,837 cubic feet (675 cubic metres) of concrete. The floor of the GRE required 29,664 CF (840 CM) of Portland Cement Concrete Pavement, poured in 20-ft (6.1-m) wide strips. Pave-Al first poured every other strip, then poured the remaining strips. “The design and execution included dowels in between the strips to maintain elevation and avoid any differential settlement,” explains Ahmed Adham, project manager, Pave-Al. Each GRE that BDI builds is custom-designed for the setting, including the winds and area in which the noise reduction is most important. “The wall heights were optimized so, for example, the wall to the south (facing the lake) was made lower and the wall to the north higher to provide more protection due to taller buildings on the City side,” explains Bojan Drakul, senior project manager, Aviation with WSP. The objective is to meet the project goals, which typically focus on aerodynamics, acoustics, aesthetics and budget, but without overbuilding the structure. The open end faces roughly west – into the prevailing winds. “Ideally, the front of the facility [the open side] can be oriented into the prevailing winds, which, when combined with suitable aerodynamic features, addresses the challenges associated with running aircraft engines at high power settings while on the ground,” Bergin explains. The GRE has aerodynamic features such as acoustically-treated vents on the side walls, rounded top edges and sloped leading edges. The interior walls are lined with over 1,700 special acoustic panels. “Our patented Noise Blotter panels are unique in that they block the transmission of aircraft engine noise and are highly absorbent, in order to avoid acoustic reflection,” Bergin says. Noise levels were measured before and after the installation of the GRE. The difference between these readings, which is measured in decibels, is referred to as insertion loss. Live aircraft acoustic testing serves two main purposes: One, it allows the owner and facility users to verify that there are no aerodynamic issues that may cause propeller stress, engine stalls, etcetera. “A part of the facility acceptance and commissioning includes the requirement for live aircraft acoustic testing that measures the noise levels between the aircraft in the facility and the aircraft outside the facility to ensure that the minimum sound drop level is achieved by the GRE. The before/after was completed on the same day to ensure the same climatic conditions are taken into consideration when doing the measurements,” Drakul says. Based on the history of noise complaints, the GRE has also succeeded in soothing the nerves of its neighbours in Toronto. Prior to constructing the GRE, run-ups took place in the same general area on the airfield, and noise complaints were not uncommon.